Flying into Los Cabos International airport, tourists don’t recognize too much damage from Hurricane Odile, which hit Baja California Sur on September 13, 2014. Driving towards the lavish hotels and beautiful resorts towards the Cabo San Lucas Marina, guests will notice how the strongest hurricane ever to make landfall in the Baja Peninsula of Mexico, destroyed almost every building in its path with its 125-mile-per-hour winds. An estimated 92% of the population were left without power or water. It was the biggest electrical disaster in the history of Mexico, according to the Mexican Electric Company (CFE). 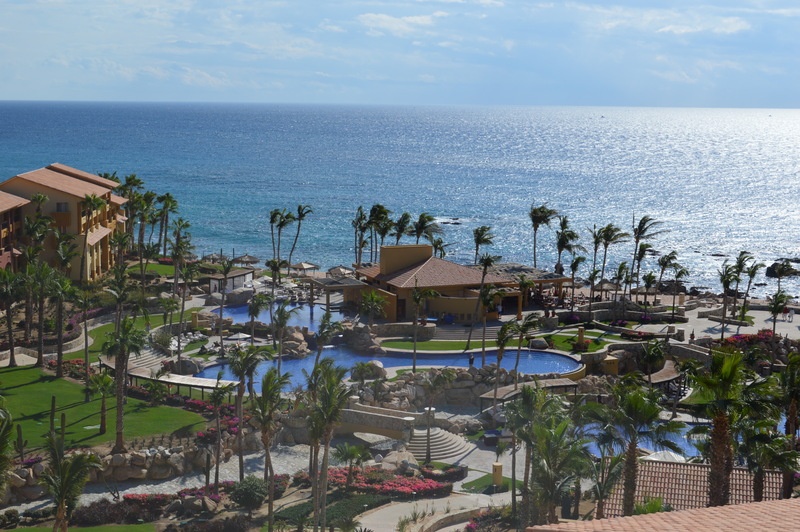 One of the first luxury resorts to open after months of repairing the damage was the Fiesta Americana Grand Los Cabos. The resort officially opened to guests on November 23, 2014 with new paint, furniture, a new lobby, spa, restaurants and landscape. The 249-room resort offers seven restaurants, five bars and five infinity-style swimming pools. There is an all-inclusive option that includes food and beverages. The friendly staff were attentive and catered to all the guests’ needs cheerfully. They are pleased that the resort was full again. January through May is an ideal time to visit Cabo to see the migration of the Pacific Gray Whales. Females arrive in the warm lagoons of the Gulf of California to give birth to their young. Guests look out along the coastline from their rooms or along the beach to see whales spouting water from their blowholes, breaching, splashing and slapping the water with their tails. In the morning guests enjoy either a seated breakfast at the Peninsula restaurant overlooking the ocean or a buffet breakfast on the outdoor patio of Vina del Mar. For a light lunch after snorkeling and swimming in the pool, guests dine at either La Cevicheria for fresh seafood dishes or the Grill Bar for burgers and fries. By sunset, families and couples dine at the handsome La Bodega Steakhouse for fresh fish specialities and steaks. There is also a Mexican cuisine restaurant, another serving Italian fare and one near the lobby serving sushi. Many guests grab a cab and take a trip into town to eat at the The Office, perhaps the most famous spot on Playa Medano in Cabo San Lucas. It suffered damage from Odile, yet re-opened on October 1, 2014 with a new face lift. Others make reservations for a sunset dinner at the beautiful Hacienda Beach Club & Residences along Medano Beach. The resort was closed for repairs for about five weeks after Odile hit. Hurricane protectors purchased and installed days before the storm saved this property millions of dollars. Cabo San Lucas offers a variety of activities from horseback riding on the beach, snorkel adventure boat tours, whale-watching trips and fishing excursions. It’s also a wonderful place to kick back with a book and margarita. Driving back to the airport, visitors can see that every resort north of the Fiesta Americana Grand Los Cabo is still closed to guests while being repaired. Many restaurants, bars and shops display “We are now open” signs to alert visitors and locals. Tours and attractions are reopening by the dozens every day. 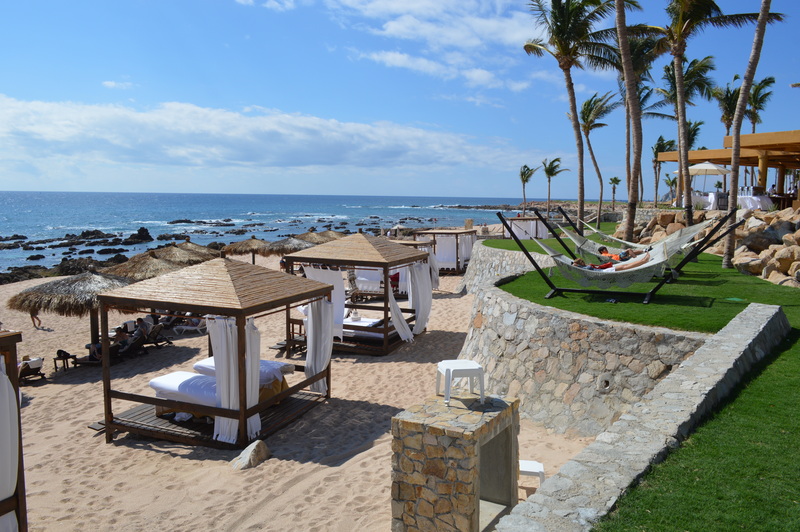 Cabo San Lucas is bouncing back from Odile with renovated resorts, friendly staffs and luxuriant sunshine to help weary visitors unwind and feel pampered.